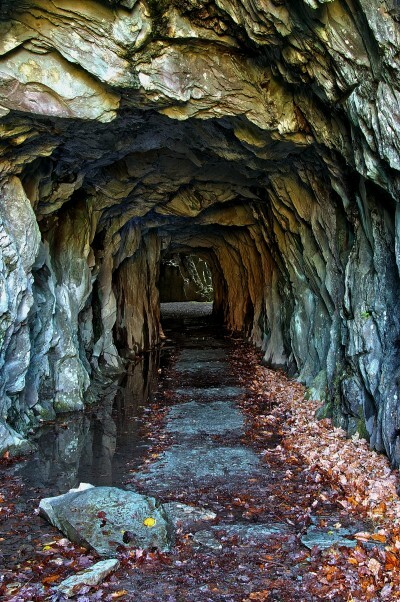 A walk down this short tunnel leads into a huge man-made slate cavern. In the centre is the 50 foot rock pillar shown in the next photo. The pool shown, is deceptively deep and ominous. Due to the difficulty of obtaining a photo with even lighting, this photo was achieved using five separate exposures. One at the correct exposure and four other exposures one stop apart either side of the correct exposure due to the difficult light levels, and merged together on the computer. This is called, 'High Definition Range' (HDR).